It rained hard all night and by morning at high tide, the surf was huge and water was coming across the beach parking lots and US 101 road loaded with rocks. They had to use bulldozers to clear the roadway. We drove to our friends, Phil and Lee's home in Del Mar and then went out for lunch at Jakes. This is a very good restaurant right on the beach. It was packed with people watching the surf. Phil having sold his business two years ago, has passed his real estate brokers exams and is ready to start work. Phil and I have been friends since Grade 2 in Toronto. After lunch we picked up the View and headed for Tony and Gillian's home in Rancho Santa Fe. Tony and I worked together at Nortel. We were greeted by 5 dogs, 3 horses, a cat, and 2 very loud birds. Their home is a beautiful, sprawling, 50's ranch with views over the orchards and hills. We spend a couple of hours touring the beautiful gardens and home. Gillian rides for miles on the horse trails in the area. For dinner a reservation had been made at, you guessed it, Jakes. That night we watched the Winter Olympics closing ceremony in Tony's theater room on a 120" screen. 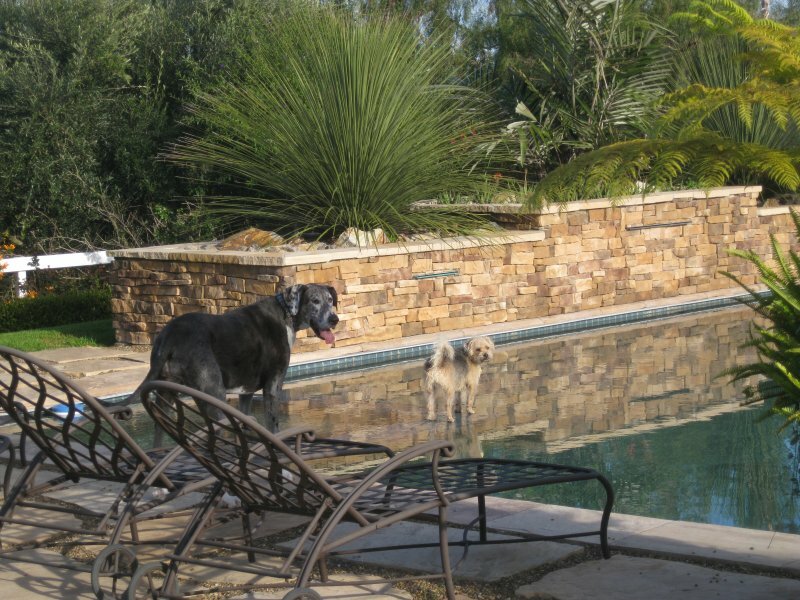 The photo shows two of the dogs, left to right, Violet and Lincoln walking on water at the swimming pool. Lincoln is the alpha dog and is a rescue dog from Mexico that lived in the streets of Tijuana. He is very smart.